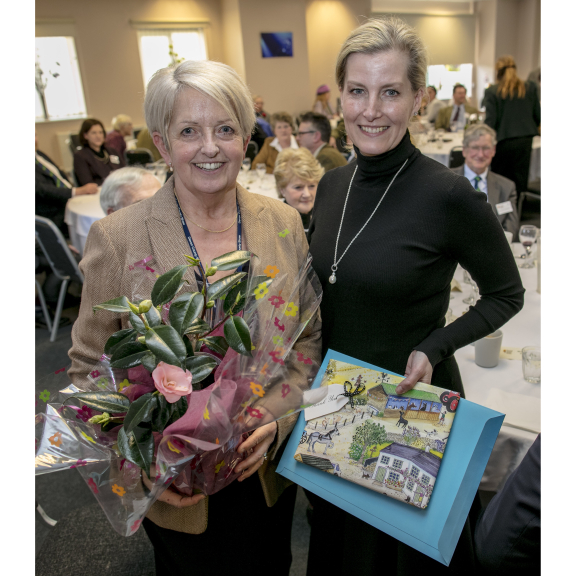 HRH The Countess of Wessex made her final visit as President of the Devon County Agricultural Association (DCAA) to Westpoint, Exeter on Friday (January 19, 2018). Over the past 12 months HRH has visited the showground five times to show her support for Devon’s agricultural and rural community. The Countess spent two days at the 2017 Devon County Show where she met farmers, school children, farming organisations and food and drink producers. Also she attended the Stockmans' Supper, a ‘thank you’ from the Show to exhibitors and livestock competitors. In addition, The Countess has attended two DCAA annual meetings; at the first in January last year she received the Presidential chain of office and on Friday (January 19, 2018) handed it on to the new President, Edward Darke. In the autumn The Countess visited Agrifest South West, which showcases high quality beef and sheep farming in the South West. Throughout the year HRH championed the Show’s Next Generation group set up to bring new people into stewardship roles. Ollie Allen, Secretary of the Devon County Show said it had been a delight to work with The Countess over the past 12 months and to introduce her to some of the very many people involved in rural life in Devon. “It has been an absolute joy to work with Her Royal Highness over the past year. She has, of course, brought great honour and distinction to the Devon County Show by being our President. Photo cap: HRH The Countess of Wessex receives birthday presents from Ollie Allen, Secretary of the Devon County Show. HRH is the retiring President of the Devon County Agricultural Association and attended the annual meeting at Westpoint, Exeter.